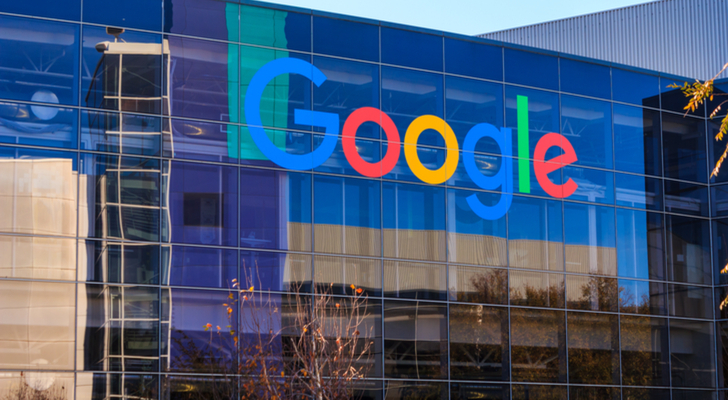 Last month’s Alphabet Inc (NASDAQ:GOOG, NASDAQ:GOOGL) earnings had investors feeling down, but off and on the price chart Alphabet stock could be back in a winning position with minimal risk for shorter-term bullish traders using a limited-risk GOOGL options spread to their advantage in an ever-volatile market. Let me explain. A profit miss at the start of February didn’t sit well with Alphabet stock investors. Shares tumbled by roughly 4.5% in the report’s immediate aftermath. But given broader market’s own dour circumstances at the time, it would be more than a bit foolhardy to see the aggressive selling and continued follow-through to the downside as backlash aimed directly at Google stock. Bottom line — or in this instance the top-line — Alphabet stock did deliver in spades with its solid overall sales growth, which beat analyst views. And with business spearheaded by a surging ads business, its growing cloud unit now a “billion dollar per quarter business” and making it “the fastest-growing major public cloud provider” in 2017, it would be even sillier to not look ahead and appreciate what 2018 might offer after last month’s broad-based sell-off. Alphabet stock’s recent correction was far from unique. In fact, the abrupt 17% pullback and test of the 200-day simple moving average mirrored the broad-based S&P 500’s own 12% decline into the key long-term moving average during the first half of February. 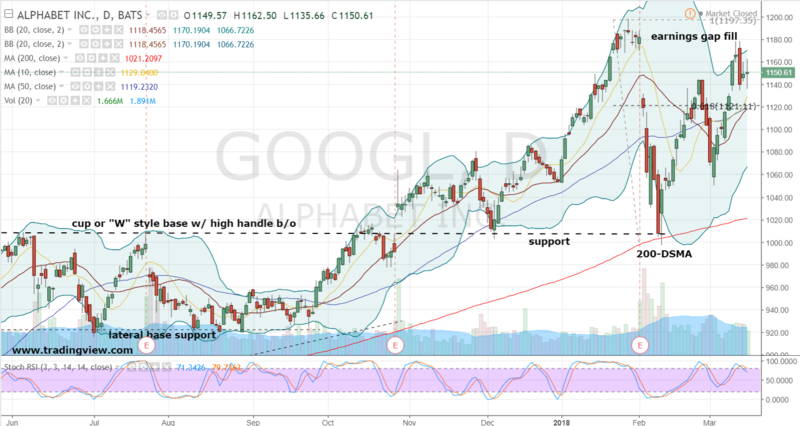 In our technical opinion though, GOOGL shares do have an advantage or two promoting a stronger chance at continued upside. Prior to February’s disruptive market decline, GOOGL had already established a lengthier corrective cup-shaped base last summer. The same can’t be said for the broader index, as it churned happily higher in a largely uninterrupted uptrend. Secondly, February’s corrective low in Alphabet stock successfully tested prior resistance for support. This was a second challenge and also stands to back shares. In the correction’s aftermath, Alphabet and the S&P 500 look remarkably similar in a good sort of way. Technically, each have cleared the 62% retracement level and formed bullish “W” patterns, while GOOGL has even filled its bearish earnings gap over the past week. With GOOGL’s additional and supportive chart work over the prior nine months, net, net I see Alphabet stock as maintaining an edge for bullish traders interested in getting long a market-weighted name. Given the speed of last month’s correction and historic run since 2009 in the market, the inclination for bullish positioning is to focus on a shorter-term strategy with minimal downside risk in the event GOOGL fails to cooperate within the framework of the current “W” set up. One spread combination that’s favored for this type situation is using a bullish modified butterfly combination. By positioning a long call butterfly out-of-the-money and designing the embedded bear call spread tighter than the closer-to-the-money bull call spread the trader enjoys the benefits of limited and reduced risk while eliminating the potential headache of Alphabet stock overshooting the spread and resulting in a loss for the “bullish” trader. Reviewing GOOGL’s options market, the long April $1,190/$1,240/$1,270 call butterfly combination is favored. With shares at $1150.61 the spread is priced for $6.50 or just over 0.50% of Alphabet stock holding risk. Despite the minimal downside exposure, if shares do make good on the current technical setup, a max profit of $43.50 is possible at $1,240 if GOOGL finds its way there at expiration. And in a less perfect but sometimes overly optimistic world, if the stock continues to rally through $1,270 and to infinity and beyond, this trader is able to pocket an enviable $13.50 profit and more than double the initial investment. Article printed from InvestorPlace Media, https://investorplace.com/2018/03/alphabet-inc-offers-way-less-risk-and-out-sized-rewards/.